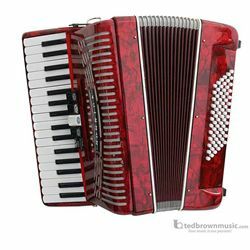 The Hohner 1305-RED Student Hohnica Accordion is the perfect start for the beginner accordion player in your life. Hohner has worked endlessly to improve a lot of features on this new version of the Hohnica. These features include an improved Mechanism for a sturdier tactile key response, tremolo tuned reeds and resonant construction. Comes in an ultra stylish, bright red color and it has a full, vibrant sound.